There are certain moments in your life when you get a chance to make a global impact. You’re excited to embark on that journey and see where it will go. You’re thrilled about the process itself as much as about the results. 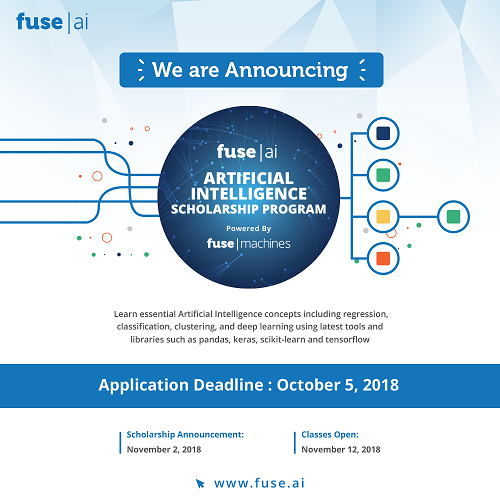 That moment for me now is with the Artificial Intelligence Scholarship Program powered by Fusemachines. The goal of this scholarship program is to provide 10,000 scholarships worldwide for basic AI courses. The scholarship program will help individuals start their careers in AI. To spread the word on the scholarship program, Fusemachines has promoted it through press release, social media posts, and by visiting colleges in Nepal. Reaching out to colleges, explaining about the exclusive scholarship program and then visiting those colleges for presentations has been exciting and meaningful. The current AI talent is concentrated in the West and with our AI scholarship, the talent can grow from Asia to Africa. It’s important to democratize AI and provide opportunities to individuals around the world and not only for a specific group in a certain destination. An article on The New York Times reported Typical A.I. specialists, including both Ph.D.s fresh out of school and people with less education and just a few years of experience, can be paid from $300,000 to $500,000 a year or more in salary and company stock, according to nine people who work for major tech companies or have entertained job offers from them. The demand for AI talent is extremely high and the supply extremely low. Thus, the need to democratize AI is not just the right thing to do but also presents a huge economic opportunity. It makes me very proud to work on a global movement that is building the future of AI talent from Nepal to Nigeria.